The global cardiac surgery instruments market is driven primarily by the growing prevalence of cardiac disorders across the world. 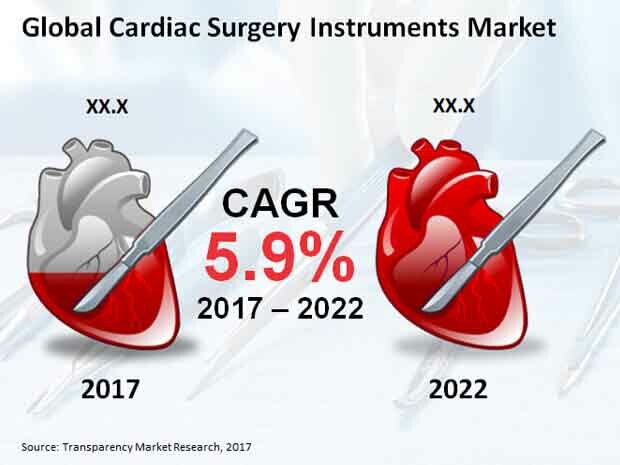 The cardiac surgery instruments market has also benefited from the cross-channel demand to improve medical devices in terms of efficacy as well as patient safety, enabling steady growth of the sector. The cardiac surgery instruments market is likely to exhibit steady growth in the coming years due to the importance of the sector to the growing cardiac healthcare and medical devices sector. Strong government support to the healthcare sector and medical devices industry is likely to remain vital for the global cardiac surgery instruments market in the coming years. The global cardiac surgery instruments market was valued at US$1,061.4 mn in 2017 and is expected to rise to US$1,412.7 mn by 2022 at a robust 5.9% CAGR. The growing prevalence of cardiac disorders in developed as well as developing countries is the prime driver for the global cardiac surgery instruments market. Cardiac disorders have risen in prevalence in recent decades due to the growing adoption of sedentary lifestyles, which is likely to remain a constant factor in the coming years. The growing adoption of the Western lifestyle and dietary pattern in emerging Southeast Asian and Latin American countries could also aid the growing prevalence of cardiac disorders in these regions, leading to growing demand from the cardiac surgery instruments market. Cardiovascular diseases account for a significant share in the total number of deaths in several countries such as Australia, New Zealand, Singapore, Thailand, the Philippines, China, South Korea, and Indonesia, where 20%-30% of total deaths are caused by cardiovascular diseases. This is likely to remain a strong driver for the cardiac surgery instruments market in the region in the coming years. The Asia Pacific except Japan market for cardiac surgery instruments is expected to exhibit a robust 6.2% CAGR over the forecast period to rise to a valuation of US$237.2 mn by 2022, while Japan is expected to gain 2 BPS in its global market share over the 2017-2022 forecast period and could account for more than 8% of the global cardiac surgery instruments market by 2022. Nevertheless, North America and Europe are likely to dominate the global cardiac surgery instruments market over the coming years due to the widespread adoption of advanced cardiac surgery protocol and strong government support for product advancement. The cardiac surgery instruments market has strong growth prospects in the coming years in developed Western economies due to the rapid growth of the healthcare industry and significant investment in the healthcare sector from private entities as well as government bodies. The North America market for cardiac surgery instruments is likely to rise from US$372.6 mn to US$503.1 mn over the 2017-2022 forecast period, exhibiting a strong 6.2% CAGR therein. Meanwhile, the Europe cardiac surgery instruments market is likely to exhibit a steady 5.5% CAGR over the 2017-2022 forecast period to rise to a valuation of US$429.9 mn. The Middle East could also emerge as a prominent contributor to the global cardiac surgery instruments market over the coming years, with the MEA market for cardiac surgery instruments set to exhibit a steady 5.4% CAGR over the 2017-2022 forecast period. The MEA cardiac surgery instruments market is likely to rise to US$53.4 mn by 2022. Leading cardiac surgery instruments market players assessed in the report include Cardivon Surgical Inc., Medline Industries Inc., Delacroix-Chevalier, Cardinal Health Inc., Becton, Dickinson, and Company, CONMED Corporation, Teleflex Incorporated, C.R. Bard Inc., and B. Braun Melsungen AG. The competition in the global cardiac surgery instruments market is likely to intensify in the coming years thanks to the growing commercial prospects of the market. Product innovation is likely to remain a successful strategy for players in the cardiac surgery instruments market in the coming years due to the need to stay afloat in the competitive and fragmented market.